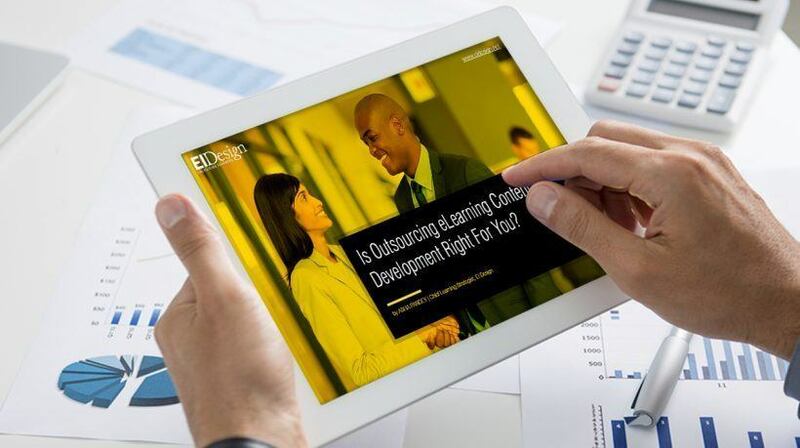 eLearning Design and Development / Free eBook: Is Outsourcing Of eLearning Content Development Right For You? Free eBook: Is Outsourcing Of eLearning Content Development Right For You? Outsourcing eLearning content development has been there for a few decades now. However, what works for one organization may not work for you. How can you be certain that outsourcing of eLearning content development is right for you? Outsourcing Of eLearning Content Development: Is It Right For You? The eBook Is Outsourcing Of eLearning Content Development Right For You? by Asha Pandey takes a deeper look at the pros and cons of outsourcing eLearning content development and if it will work for you. Asha uses her 14 years of experience as an offshore development partner for several organizations globally to provide practical insights that you can use. This eBook takes a deeper look at the pros and cons of outsourcing eLearning content development. The eBook Is Outsourcing Of eLearning Content Development Right For You? is a useful ready reckoner to understand the benefits of outsourcing eLearning content development. What is more useful is the understanding of inherent challenges that it has. A combination of both aspects can provide the right cues to help you decide if outsourcing is right for you. Asha is the Co-founder and Chief Learning Strategist at EI Design. EI Design was the first time entrant to eLearning Industry’s Top 10 eLearning Content Providers and made it to the #2 slot. An Instructional Designer (with over 16 years’ experience) with a passion for Innovation and Exploration, Asha brings in practical insights in all her writings that make it easy to apply them in your organization. Over the last 14 years, she has worked with the Business Development team at EI Design on new customer acquisition. Asha uses her real-life experiences to secure partnerships (with several organizations looking at outsourcing custom eLearning content development) and then strategies to nurture and cement them. In the process (through both successes and failures that came with these opportunities), she has collected a wealth of practical pointers on outsourcing and how one can make it work and grow. Many of these practices are unique to the engagement model that EI Design offers to its global customers. Currently, she is working with her Innovation team on a model that can predict Learnability for online courses. A potential game-changer in predicting the Learnability index of any course, this is slated for release in Oct’16. Through a series of thought-provoking questions, the eBook begins with an analysis of your need to outsource. It then moves on to the benefits and challenges that are intrinsic to outsourcing and evaluates if the challenges can be mitigated sufficiently and enable you to meet your mandate. What factors trigger the need to outsource eLearning content development? What are the benefits that you can expect as you outsource eLearning content development? What are the challenges that you must be aware of before you decide to outsource eLearning content development? Can the challenges in outsourcing be adequately controlled or mitigated? Do download this free eBook Is Outsourcing Of eLearning Content Development Right For You?. You will find the inputs to be useful in validating your need and establish a successful outsourcing strategy.